Dearneside Fabrications Ltd, one of the country’s leading Architectural Metalwork Specialists based in Sheffield are pleased to announce that over the last 12-month period March 16 the company has secured orders in excess of £16 million pounds resulting in an unprecedented forward order book of £15 million. Turnover for the that period is £13.5 Million an increase of 58% on the previous year. Dearneside have once again secured several large Balconies Packages within the Prime Residential Sector of Central London. Notable projects include the prestigious Merano Scheme – One of the finest developments on the River Thames. Merano Residences is designed by one of the world’s most celebrated architects Rogers Stirk Harbour + Partners. A further landmark job is 190 The Strand for St Edward. Both schemes feature Penthouses in excess of £10 Million pounds highlighting the quality of craftsmanship which Dearneside will deliver. The company has enjoyed considerable success in the East of London this year; notable contracts include a record £6 Million package on the huge Royal Wharf development. Other packages comprise of London City Island (2 Phases) on the Leamouth Peninsula and Chobham Manor, Stratford (the first new residential development on the Olympic Park post 2012). Numerous landmark projects have been completed over this period including the much publicised Embassy Gardens (High End Residential Scheme surrounding the new American Embassy). The Pinnacle building which is the centre piece of the Battersea Reach development and the Tribeca Square project (anchored in the Elephant and Castle redevelopment area of South London) have both been successfully delivered. Over recent years the company has become known as the premier Architectural Metalwork Contractor operating in large retail-lead schemes. The company is proud to be associated with the current Meadowhall redevelopment where it is delivering a £1m + balustrade package in its home city. Adding to Dearnesides current portfolio of completed retail schemes this year are the Victoria Centre (Nottingham), Westfield Broadway (Bradford) and the Southside (Wandsworth) Centre. Dearneside Fabrications were shortlisted for the prestigious Tekla Awards in 2015 for the "Pinnacle Building" in London, constructed by London's leading residential developer, St George. The Tekla Awards showcase and reward the hard work and innovation that goes into using software to solve engineering challenges. Continued investment this year has included the construction of our new Stainless Steel Fabrication Facility on the Trafalgar Works site following an award from the local RGF Fund. Planned investment for the next 12 months include significant work on our neighbouring Wallace Road Site. The company has strengthened its Senior Management Team with a new Operations Director, a London Regional Operations Manager plus London based Contract Managers. 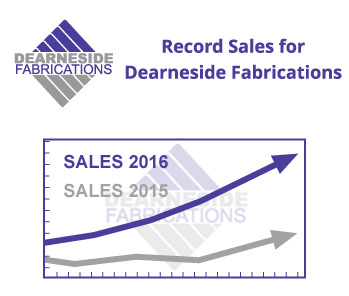 Dearneside is currently in advanced negotiations on several new multimillion pound packages and in the next 12 months we envisage continued growth in a manner that can be sustained in line with its current strategic business plan. Dearneside Fabrications has once again been shortlisted for the prestigious Tekla Awards – 2016. Dearneside Entry this year is THE “Merano Residences” designed by celebrated architects Rogers Stirk Harbour + Partners. The new, high-quality mixed-use development, by developers St James of Berkeley Group, will comprise of three stepped bays. Each with an individual signature coloured facade and varying in height to create a dynamic skyline. The blocks, which are to be 14, 21 and 28 storeys, will accommodate apartments and office space on the lower floors. The balconies, winter gardens and staircases within the Merano Tekla model incorporate numerous elements including mild steel, stainless steel, structural glass, timber, composite decking and aluminium cladding along with a bespoke integrated Macalloy tension bar system for the balconies. All items are encompassed within one model with the relevant information being distributed for fabrication and procurement both in-house and to external suppliers. 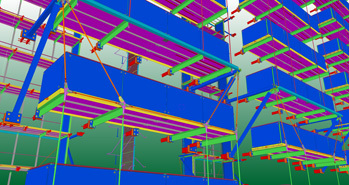 The Tekla Awards focus on projects of all shapes and sizes which have used Tekla software as part of the process for designing and modelling structures or where the use of Tekla software has aided collaboration. Please click on the link (opens in a new window) and vote. 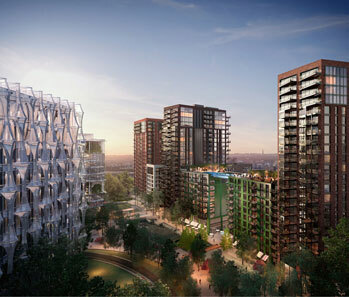 Dearneside Fabrications are pleased to announce they have been awarded the Balcony and Architectural Metalwork package on the Phase 2 at Embassy Gardens, London. The company has been onsite for the previous 2 years delivering over £3 million of Balconies /Architectural Metalwork on Blocks A10 & A11 on Phase 1. Heralded as London’s new diplomatic precinct, Embassy Gardens will reflect this with its use of stylish design and craftsmanship. The design style is distinctive, with the red-brick exteriors inspired by the historic meatpacking districts of New York, and with influences of London’s historic Victorian and Edwardian mansion blocks. Comprising 179 suites, one, two, three bed apartments and a stunning penthouse, the release of the second phase offers potential purchasers the opportunity to buy in one of London’s most exciting residential schemes. The pinnacle of the development is the Sky Pool, a stunning suspended swimming pool which links two buildings at the tenth storey – the first of its kind in the world. Entirely transparent and structure-free, the pool will allow residents to swim from one building to the other – a 35m high aqua bridge in the sky. 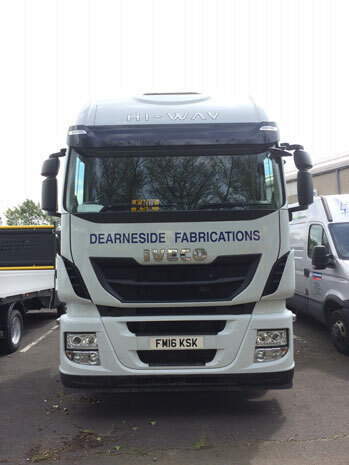 Dearneside have recently purchased an additional Iveco Highway boosting its in-house transport capabilities to 3 Iveco vehicles and 20 + Mercedes Sprinter Vans. The Iveco Highway is the best in terms of efficiency and performance – thanks to the new Euro VI engine, based in part on the higher torque and power delivered by the engine. 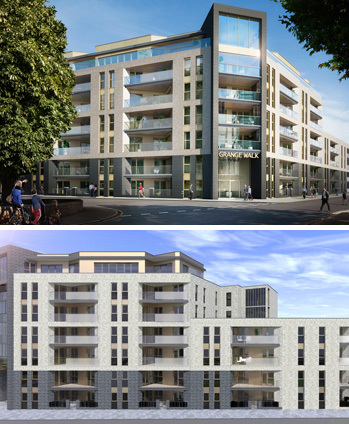 Dearneside Fabrications is pleased to announce it has recently secured the Balcony and Architectural Metalwork on the Corio development at Grange Walk, Bermondsey for Linden Homes (Value Circa £1Million). This will be the company’s second significant package with Linden Homes. And closely follows the completion of works at “The Residence” (Blackfriars Road) where the company has recently completed the Architectural Metalwork Package. Project Overview Desirable Bermondsey will shortly become home to Corio; Linden Homes’ statement collection of 1, 2 and 3 bedroom apartments. Situated on Grange Walk, this landmark new residential address presents an opportunity to take advantage of village-style living within striking distance of the City, meaning you can enjoy the very best of both worlds. The company is most pleased to announce it has been awarded the Balcony and Architectural Metalwork Package on the Royal Wharf Development in East London. This latest contract with Ballymore follows “Embassy Gardens” Nine Elms and the “London City Island” where Dearneside have carried out numerous Balcony packages. In the first 9 months of the current financial year the company have received record orders in excess of £16.5 million pounds, resulting in an unprecedented forward order book in excess of £15 million. 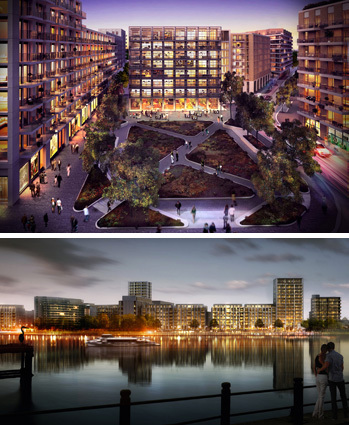 Project Overview with approximately 500m of direct south facing river frontage, Royal Wharf offers high-quality waterside living with stunning panoramic views. The scale of Royal Wharf offers the potential to create a new great estate for London. Not only does Royal Wharf offer a stunning south facing riverside promenade, but also has at its heart a new vibrant high street connecting parks and squares. The development will consist of 3,385 homes in total, a beautiful riverside walkway, new streets, connecting parks and squares, as well as new apartment buildings with views of the River Thames, a new school, shops, offices and riverside restaurants, catering for a population that is estimated to reach 10,000 by completion.